Mustangs running free on the open range are an inspiring sight – their tails like flags flowing in the wind, the loud thunder of their hooves echoing across the prairie. Today, wild mustangs symbolize the legacy of the old west like few other animals. 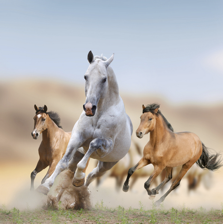 First turned loose by cowboys to forage on the open range when the United States was a new country, mustangs have multiplied in number and now include tens of thousands of wild horses – some still running free -- others cared for at holding facilities and in private pastures. Who keeps track of these living symbols of our American heritage and makes sure their habitat can sustain them? It is the Bureau of Land Management, a branch of the United States government’s Department of the Interior. They oversee all of the land owned by the Federal Government – some 256 million acres nationwide. That means they are focused not only on wild horses, but also on energy sources, conservation efforts, and wildlife habitats. To keep track of these wild horses -- which now number over 66,000 -- is an awesome task. To do it, the Bureau – often called the BLM -- uses a process called freeze-branding to mark the left side of each animal’s neck with a series of angles and lines. Freeze branding uses chilled branding irons that alter the pigment producing cells it touches. When the hair grows back it is easily readable on most horses because it is white. At first glance, the symbols may look meaningless, but the lines and angles identify each horse by year of birth and special identification (ID) number. Understanding the symbols is simple if you know how to interpret the code. It includes an eight-pointed star with a number assigned to each point. The de-coder looks like the star pictured here. special training and adoption so that public grasslands are not overgrazed. The first part of his brand indicates his U.S. government registration. It looks like the capital letter U. The second two symbols -- read from top to bottom -- tell his year of birth. The next string of underlined angles and bars are his specific registration number. They’re important because they make certain anyone wanting to adopt him gets the right horse. Are you ready to break the code? After the letter U, concentrate on the last two symbols (the = and the >) to discover Henry’s year of birth. Next decipher the string of symbols using the eight-pointed star to find a number. Then you too can break the code to discover Henry’s unique ID. If you’d like to know more about wild mustangs, learn how to adopt one or enter a Mustang Challenge, contact the Mustang Heritage Foundation. They’ll help you get involved and learn more about mustangs – and the breed’s intriguing part in the history of the old west. P.S. Henry was born 2005 because = means 0 and > means 5. His number is 597800.